When selecting a tuxedo jacket, several things must be taken into consideration, including the lapel, collar, and whether the item is single or double-breasted. Unfortunately, the look of these things including the fabric can remind some of cheap tuxedo jackets. While a discount on a quality tuxedo rental or purchase is welcomed, a reduction in quality is not. There's nothing more fortunate than seeing cheap tuxedo jackets on men at a high-end event. Even outdated tuxedo jackets can give off a cheap look if the fabric, fit, and style are wrong. Menusa offers a broad selection of styles for those seeking to save a few dollars and still appear fashionable. Simply keep the noted tips and your body type in mind when searching for your ideal look. Speaking of appropriate looks, when is a red velvet tuxedo jacket ever appropriate? 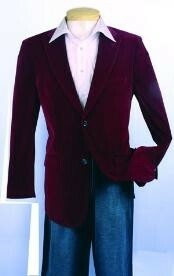 Also known as a smoking jacket, a red velvet tuxedo jacket is best worn during a private house party or a special club event. A black-tie affair is never an appropriate occasion for this type of attire since it is a more traditional style setting and not meant for individuals to stand out in such an obvious way. Style options for a traditional tuxedo jacket still remain in effect, therefore, a single or double breasted jacket is always a possibility. 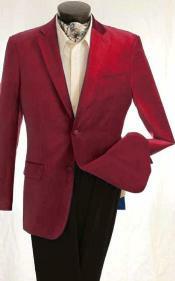 And when it comes to the red velvet tuxedo jacket, you may have seen your favorite celebrity sport it at a major event. 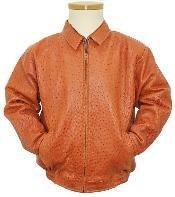 Different designers have produced this jacket at various costs and with various features. Surprisingly enough, the red velvet tuxedo jacket also goes by different names including red velvet smoking and dinner jacket. Needless to say, the red velvet tuxedo jacket-also available in deep red and even burgundy--is a style option available only to the man who knows how to properly wear it and who is ready to pull off an amazing look with great character. And the best thing about it is that it doesn't have to be worn with matching red velvet trousers!